Beta sup­port for mark attach­ment (for Latin, Cyril­lic and, to some extent, Greek). Improved screen qual­ity: auto­hinted using ttfau­to­hint 1.3. Please test these fonts exten­sively and con­tact us if you find any problems! 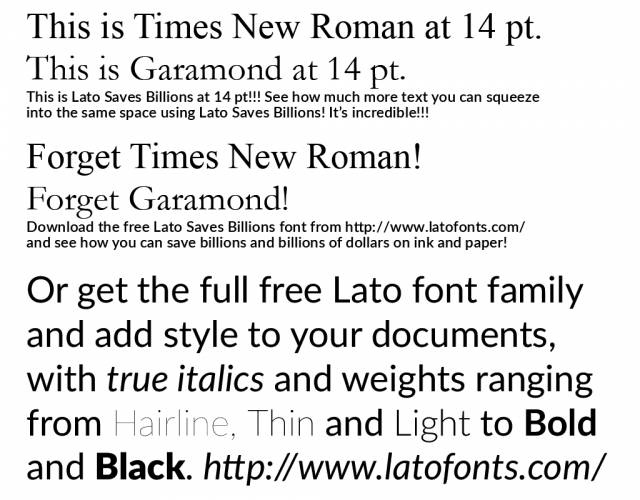 These fonts have the same improve­ments as the desk­top fonts. 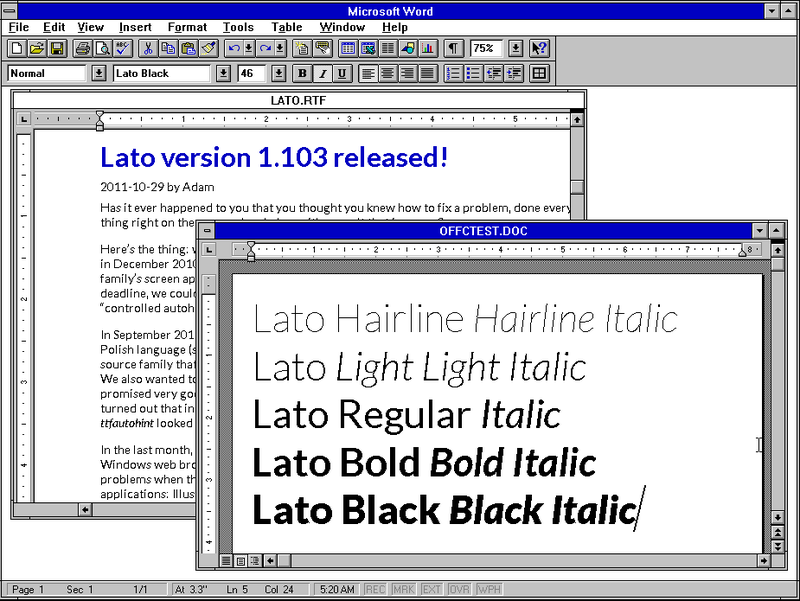 In addi­tion, they come in two fla­vors: “Lato” with full char­ac­ter set (160−640 KB per font) and “Lato­Latin” with just the Latin char­ac­ters (40−150 KB per font). The web font kits now include WOFF2, WOFF, EOT and TTF. We believe that the “ran­dom dis­ap­pear­ing char­ac­ters” prob­lem has been resolved as well! Improved some con­tour bugs and dia­crit­ics positioning. Revised OTL fea­tures so that they will work in browsers. Improved screen qual­ity: auto­hinted using ttfau­to­hint 1.1. Updated Medium weight to pro­vide more visual dif­fer­ence from Regular. Note that the web­font down­loads avail­able here are still in the older 2.007 ver­sion. We’re work­ing on updat­ing them. In the mean­time, you can use the FontSquir­rel gen­er­a­tor to con­vert the new 2.010 desk­top fonts to web­fonts. Also, it’ll take some time before the fonts appear in web­font ser­vices such as Google Fonts or Adobe TypeKit. Get the free Lato Saves Billions font and save billions of dollars!!! 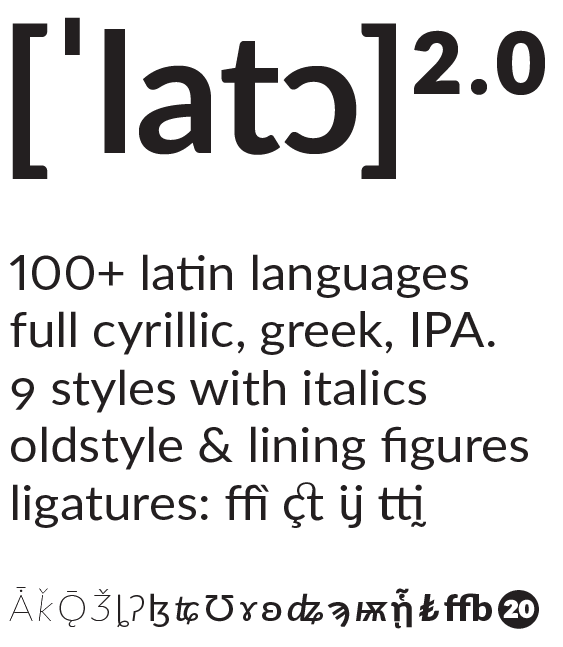 We’re proud to announce the release of the 2.007 ver­sion of the Lato fam­ily. We’ve worked on it for almost a year. It’s the first release of the com­plete rework­ing of Lato. It’s already very good, but there may be some issues here and there. If you find some prob­lems, let us know! The fam­ily now con­sists of nine weights with ital­ics, and each font includes 2300+ glyphs, so the fam­ily now sup­ports 100+ Latin-​​based lan­guages, 50+ Cyrillic-​​based lan­guages as well as Greek and IPA pho­net­ics. We also revised the met­rics and kern­ing of the fam­ily. Note: the Reg­u­lar and Medium weights have very lit­tle dif­fer­ence, so you can pick either for text pur­poses. You can also pick the Reg­u­lar weight for dark-​​on-​​light text, and the Medium for light-​​on-​​dark. 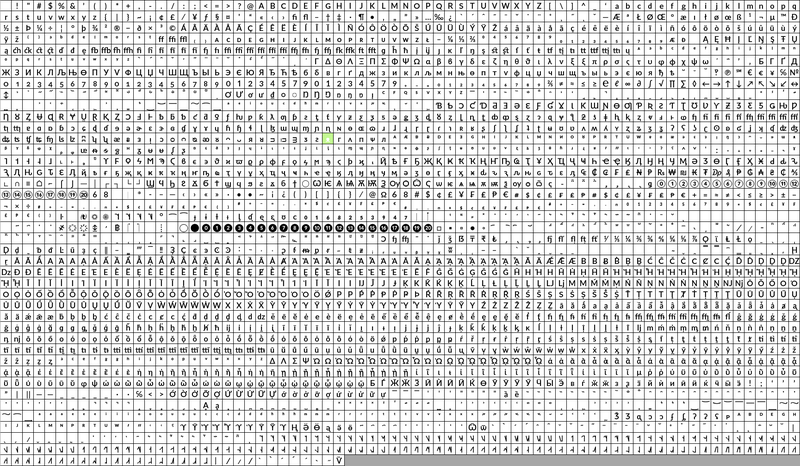 Click on Down­load TTF to down­load a ZIP archive con­tain­ing ver­sion ver­sion 2.007 of the Lato fonts in TrueType-​​flavored Open­Type for­mat (.ttf), which you can install on your com­puter. 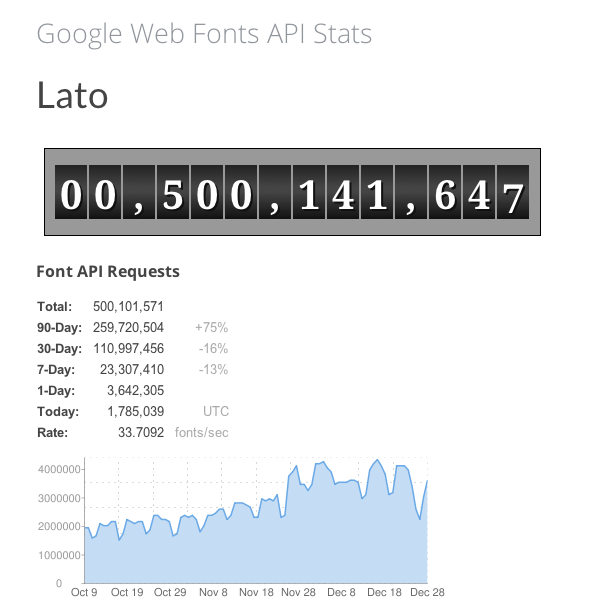 Cur­rently, the Lato fonts on Google Fonts are still the older 1.0 ver­sion. If you’d like to use the new 2.007 ver­sion on your web­site, you need to install a “self-​​hosted web­font kit” on your server. We do not pro­vide sup­port or instruc­tions how to install these fonts on your web­site! You need to fig­ure it out on your own! Click on Down­load Web­fonts to down­load a ZIP archive con­tain­ing ver­sion 2.007 of the Lato fonts as a web­font kit for self-​​hosting. The ZIP con­tains two sub­fold­ers: Lato and Lato­Latin. 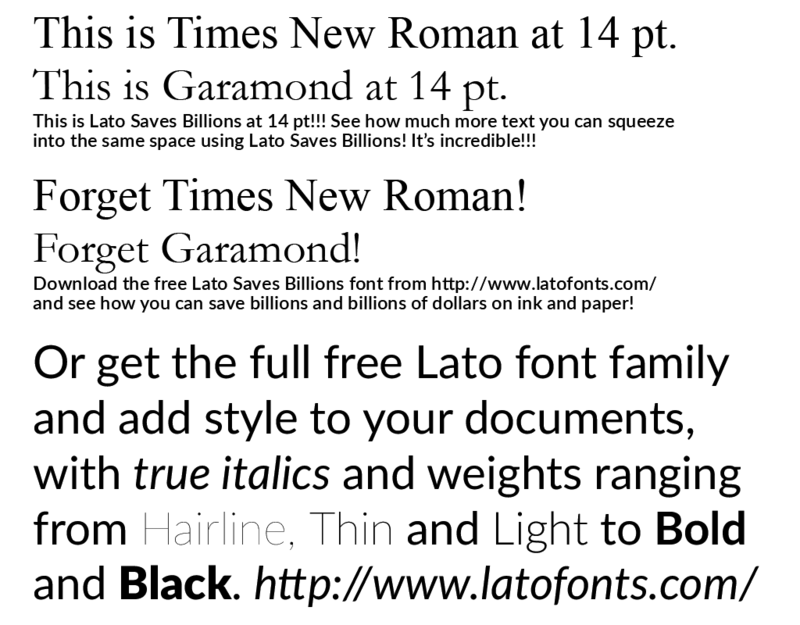 The Lato sub­folder con­tains web­fonts with the com­plete char­ac­ter set (250−700 KB per font) while the Lato­Latin sub­folder con­tains smaller ver­sions that only include the most impor­tant glyphs for Euro­pean Latin-​​based lan­guages (75−200 KB per font). Best regards, and have fun with this release! The down­load archive now con­tains an “OTF” sub­folder with the Lato fonts in Open­Type PS for­mat, and a “TTF” sub­folder with the fonts in Open­Type TT format. Please do not install both the OTF and the TTF vari­ants on your computer! To down­load Lato 1.105, please click on the “DOWNLOAD ZIP” link in the right column. We have just released Lato ver­sion 1.104. We decided to “split” the release. The fonts intended for peo­ple to down­load and use in desk­top appli­ca­tions were to be FontLab-​​​​autohinted while the fonts that should be deployed at Google Web Fonts should use ttfautohint. You can down­load ver­sion 1.104 by click­ing on the down­load link on the right of this page. Enjoy!